India is the home of some remarkable innovations for and by disabled persons. 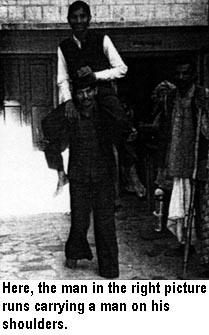 The Jaipur Foot, now world famous, was developed by an orthopedic surgeon, Dr. P.K. Sethi, in response to a disturbing realization. 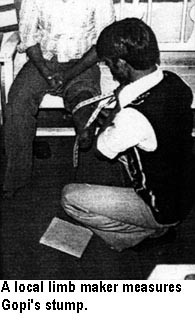 A kind-hearted person, he had gone to great efforts to provide the best, most modern fiberglass-and-resin Western prosthetics to the neediest of amputees. 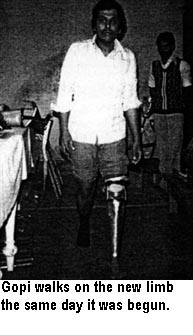 Weeks or months later, he would see these same amputees hobbling on crutches, without their limbs. Humbly, he asked them why. Apologetically, they told him. 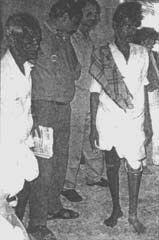 He began to realize that limbs well-suited to a Northern city are completely out of place in rural India. 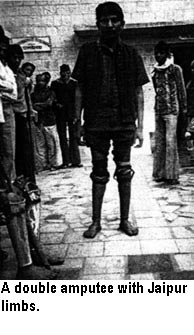 Indian villagers need a leg with which they can go barefoot into homes and temples, squat at their toilet, sit cross-legged on the floor while eating, and work knee-deep in the mud of rice paddies. 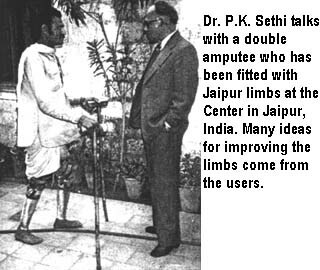 Through a process of trial and error, with a lot of feed-back from village amputees, Dr. Sethi developed a design that was more suited to the traditions, poverty, and environment of rural India. The Jaipur foot-piece is heat-molded in iron forms in which pieces of wood are covered with vulcanized rubber. It is very flexible, water-proof, and looks real (with toes, veins, and skin color). The foot is fixed to a lightweight aluminum shank crafted by traditional tinsmiths. The above-the-knee limb has a swivel knee joint that permits comfortable squatting and cross-legged sitting. The Jaipur foot is so practical and low-cost, that it is now produced in many countries of Asia, Africa and Latin America. At many community centers that make these limbs - including a large center in Colombo, Sri Lanka - most of the limb-makers are themselves amputees. Because the Jaipur technology is already widely known, here we will limit our description to only a few photos. 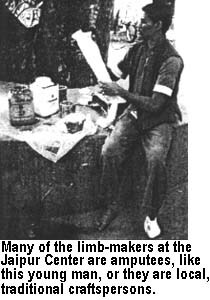 The limb was developed working closely with local disabled persons and with local craftspersons. Much can be learned from this cooperative learning process. The Jaipur foot is not the only user-centered breakthrough in prosthetic limbs from India. 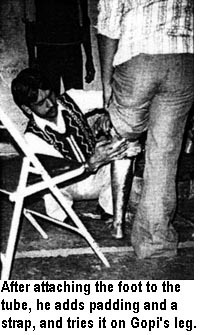 In 1986, Meena Dadha, a remarkable woman from Madras, became concerned that there were hundreds of thousands of amputees in India who needed a limb and could lead more fruitful, happier lives if they had one. 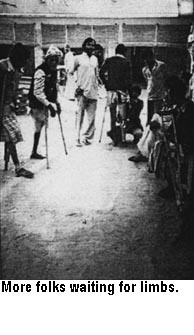 A method of leg-making was needed where limb-making teams could "go to the people," even in remote villages, and make good quality legs quickly at low cost. Mukti is the name of a limb-making program that has its main base in Madras, and runs a mobile outreach program to rural areas. 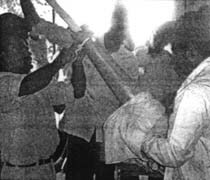 The limb-making equipment is transported in a van to small towns that invite Mukti's service and agree to bring together amputees from nearby villages. A 5 or 6 day workshop is organized in a temple, meeting hall, or school. To make the limb, a plaster mold of the stump is made. To the bottom of this mold, plaster of Paris is added to form a mold of the entire shank. To do this, a cardboard cone is attached to the bottom of the stump mold, and filled with plaster-of-Paris (see drawings on next pages). 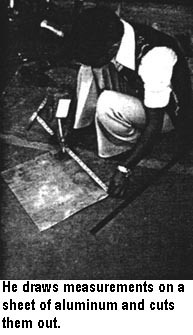 A measured section of plastic pipe is put over a stout wooden stick, and is heated in an oven until it begins to droop. 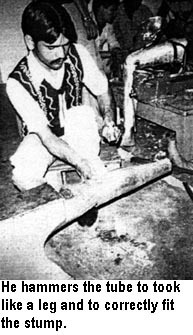 Then, the hot pipe is stretched over the cast of the leg. On cooling, the plaster is removed from the inside of the mold. 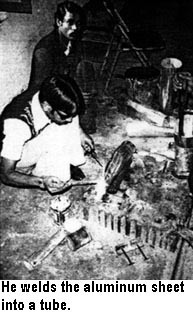 A pre-made rubber foot, similar to a Jaipur foot (produced in different sizes in Mukti's center in Madras), is fixed to the bottom of the shank. Straps are attached to the top of the limb to hold it firmly on the stump. The results are impressive. The elderly farm worker whom I saw fitted was able to walk surprisingly well with his new, light-weight leg on that same afternoon. He was overjoyed. A series of drawings on how to make the limb, from a booklet by Mukti, are reproduced on the next 3 pages. More information on Mukti Limbs can be obtained from Mukti, (address on page 342). 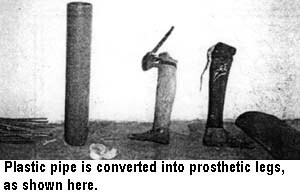 Many other groups are also experimenting with limbs and braces made from plastic pipe, including Handicap International (address on page 341).